Sad Face: What to Put on It | Bright & Beautyfull! IRELAND 1 — CROATIA 3 I wish I didn’t care about the footie so much. It is an odd thing, all the emotional energy that one can generate/expend, even when one is watching a match on one’s laptop, much less when one is in an actual stadium. It’s a tribal thing for sure, what with the drums and the face painting, and I love every single second of it — except when it makes me want to puke, and my heart is beating like it’s going to go into arrest, and I scream obscenities at the top of my lungs as though I had no class a’tall. So I am sitting here looking at stuff on my desk and just don’t even know. My face is so sad, what could possible help cheer it up? I usually find Lancôme skincare products err too much on the side of their signature scent, but today, it is just the ticket. 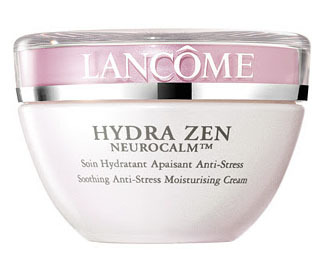 And their Hydra Zen Neurocalm Anti-Stress Moisturising Cream would have come in handy last night. I’ll have to remember it for Thursday when we take on Spain. Bliss is always good, as a concept and as a line of spa-quality product. My poor peepers have just benefited from Triple Oxygen Instant Energizing Eye Gel, which is cooling, soothing, and yes, energizing-with-a-z… but they can’t unsee that third Croation goal. I am losing the will, to be honest… and I am usually really good about prices and stuff, but eh, just don’t have the energy. 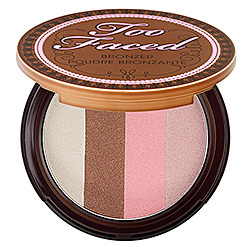 One thing that always makes me happy is Snow Bunny: Carribbean in a Compact from Too Faced. It is the absolute best bronzer on the planet, and the golden brown, wedded with the white, pink, and fawn shimmer creates a youthful, healthy glow. I had to stock up when I was in the States, and you will have to order it online — unless someone knows a Irish stockist? Could I have some good news, pleassssse??? That’s all I got, friends. Really gutted, but ah, sure, you never know, and Spain and Italy — anything could happen, yeah?